Monday is always a tough day. Work and errands fill the day, leaving little time to think about what to make for dinner. PoppaNut and I often have the same thing: plain chicken breast and steamed veggies with rice. I can’t say I don’t like it; I do like it. It’s light and tasty, especially with a little cheese on the veggies. But I’m ready to challenge my cooking skills a bit more. I have decided to make a homemade meal on Saturday night, something that will warm PoppaNut’s tummy and leave his lips smacking for more. Plus, it makes it easier to eat chicken and veggies during the week when I know something good is coming. I’m scouring websites looking for just the right dish. I found a few really good options on BettyCrocker.com. Who knew Betty did more than baked goods? Seems like Betty is a busy woman, because her site has it all: party menus, videos, cooking tips and TONS of recipes. 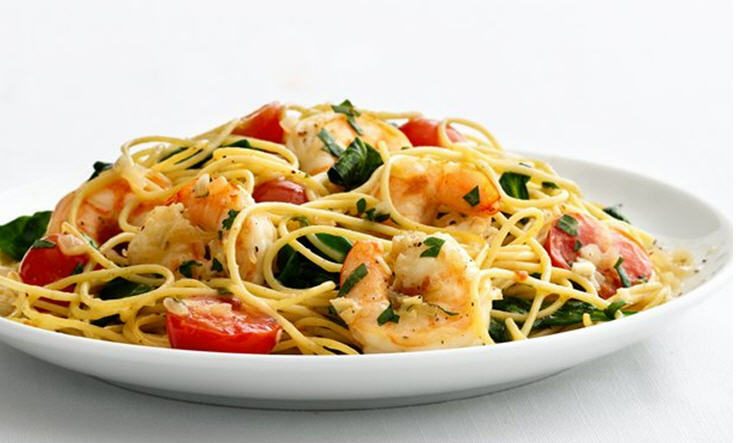 This recipe for Garlic Shrimp Pasta looks delicious. In 5-quart saucepan or Dutch oven, cook pasta as directed on package. Drain; return to saucepan. Stir in spinach, tomatoes and 2 teaspoons of the oil. Cover to keep warm. While pasta is cooking, in 12-inch nonstick skillet, heat remaining 1 teaspoon oil over medium-high heat. Add onion; cook and stir 1 minute. Add shrimp, garlic and pepper flakes; cook and stir 2 minutes. Stir in wine, broth, salt and pepper; cook 2 minutes or until shrimp are pink and firm. Remove from heat; stir in parsley and butter until butter is melted. Add shrimp mixture to pasta mixture in saucepan; toss to mix. We also got a slow cooker for our wedding, and it has been sitting in the cupboard for awhile. I pull it out every now and then when I’m making homemade sloppy joes (I’ll share the recipe another time). But, I think it might be time to dust it off for this delicious recipe. What do you think? In 10-inch skillet, cook ground beef, onion and garlic over medium-high heat, stirring frequently, until beef is thoroughly cooked; drain. Stir in soup and chiles. Spray 3 1/2- to 4-quart slow cooker with cooking spray. Spread about 1/4 cup of the enchilada sauce in bottom of slow cooker. Place 4 corn tortillas over sauce, overlapping and breaking in half as necessary to make an even layer. Top with 1/3 of beef mixture, spreading evenly. Drizzle with about 1/4 cup enchilada sauce. Sprinkle with 1 cup of the cheese. 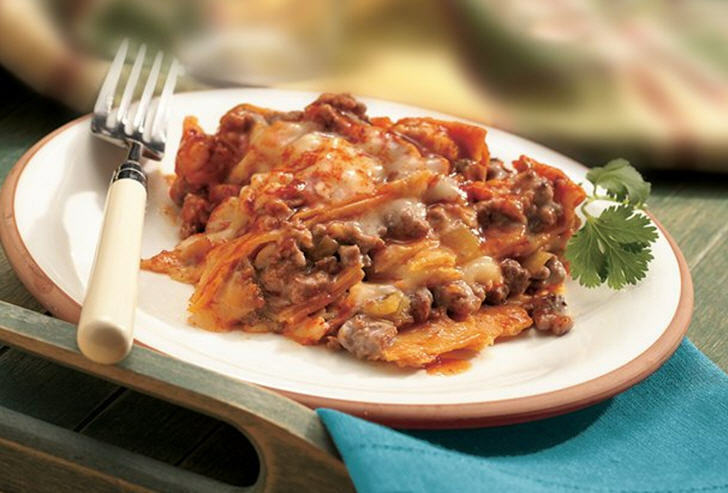 Repeat layering twice, using 3 corn tortillas and half of remaining beef mixture, enchilada sauce and cheese in each layer. Sprinkle paprika over top. And that’s life in a nutshell … finding the perfect dinner to make the one you love. I’ll let you know when I end up making!